If I ever attempt the making of a Catholic set of Oracle cards (!? 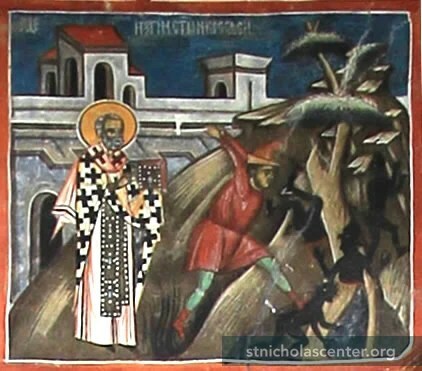 ), the deck will certainly feature St Nicholas of Myra, whose feast day is today. He is also known as St Nicholas Thaumaturgus, the Wonderworker, for he is one of the few saints in history who has earned the appellation of ‘thaumaturge’. He is a vessel of the old magic, of the power that looks into the face of evil and fills that evil with dread, then turns away, because it has heard the cry of the poor, and must put the oceans and winds at their service. Catholics of recent times have chosen to honour the bishop of Myra by remembering the time he slapped Arius across the face during an Ecumenical Council. Well, it’s a pretty funny story, and I think I’ve a post of that nature somewhere on this blog. But there was more to St Nicholas than that. His wonders were not just the miraculous healing of illnesses, the calming of storms at sea or the expulsion of demons, all of which are attributed to him. He also reunited stolen-and-enslaved children with their parents through the miraculous transport of those children over the seas. He restored to life children who had been murdered (and pickled in brine.) And, while leaving gold on the windows of poor families contemplating the sale of their daughters into prostitution is an act of mercy and grace rather than a miracle in the proper sense, how much must it have seemed a miracle of providence to those powerless girls? St Nicholas was the man who actually cared equally for children, women and men. The themes of his miracles make him the natural patron for slaves, for trafficked women and children and for those who work for the rescue of slaves and endangered children. His restoring of murdered infants to life makes him the natural patron of those children likewise at risk of dismemberment and death, as well of those parents who, like the desperate father in the story of the nearly-trafficked girls, was driven to his choice by the pressure of circumstance, rather than by native ill-will. As such, the Feast Day of St Nicholas is an appropriate time to do something ourselves for trafficked, enslaved, or abortion-endangered souls. There are any number of organisations, both secular and religious, working for these ends, to whom a single donation will mean a great deal. The two I recommend here are broadly Christian and mostly Protestant, but I offer them to both Catholic and non-religious people because in neither case is the service of others a thin front for missionary work. Christianity informs the prayer-lives of the workers, and their publications are infused with their hope in and praise of God, but their day-to-day objectives are practical service and their achievements are not less because of it. Diamond Women’s Support provides holistic support to women and couples experiencing a crisis pregnancy, as well as individual and couples counselling for post-abortion grief or post-abortion trauma. Their services to expectant mothers are given gratis, and include counselling, case management, doula support, ongoing material donations, and mentoring and social support for at least the first year of parenting. They work with women of every demographic, and, (I’m happy to vouch for this) respect the culture or faith of each client without being false to their own Christian origins. Their counsellors hold professional qualifications and are eligible for membership with Australia’s secular governing bodies for the counselling and psychotherapy industry. Their playgroup and mentoring program means that their clients don’t just disappear and turn into single-mother statistics…and I have to admit it is pretty lovely to see their little toddlers becoming friends! Well, they’ve just opened a shop! (I don’t know if it works. I always doubt new things when technology is involved). So, you can donate their website, or try the shop (possibly) here. If you’d rather be run over by a truck than donate to any kind of Christian organisation, you might consider Feminists for Life or Karinya House? One way or another, be the St Nicholas! The whole time I was writing that post, something has been scratching like a maniac at my window and buzzing. Call me imaginative, but I find it unsettling. Well, I don’t care, you window-scratching psycho! Here’s my saint expelling demons from a tree!